After Day 1 here in Germany at Estering Buxtehude, Ramona and her team look back at a typical day of rallycross- one that is mixed with ups and downs. Day one consists of two heats for the Super Car class. Points gained here are used going forward the following day to reach the Semis and further. Heat 1 offered a great start for Ramona. She had a great start and showed good form through out the race finishing third and putting her in fourth place in the EuropeanRX leader board and twelfth overall within the WorldRX leader board. “The car feels good, I feel comfortable and I’m really pleased with the race. I think we can make some more adjustments to the car for me to push harder in the next heat.” explained Ramona after heat 1. The second heat however did not offer her the chance to take advantage of the improvements her mechanics made. Just after the start she was completely wedged on both sides with the right side receiving the brunt of the impact. 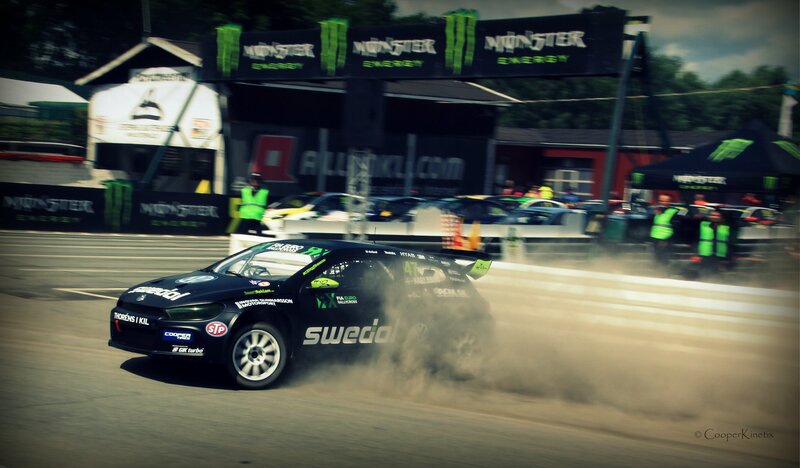 With the dampers and suspension badly damaged a DNF was the result of heat 2. Regardless of this Ramona remains upbeat. Even with the DNF from the second heat, having driven a great time in heat 1 she is now twelfth within the EuroRX championship. Her engineers are presently eagerly working to get her Volkswagen Scirocco fit and ready for tomorrow!